Can an all solid guitar for this price be any good? Spectacular value for money, and just a great guitar in its own right. Incredible spec for the price. You might miss the convenience of an onboard tuner. Cort is possibly the biggest guitar builder that most guitarists have never heard of. And while the majority of its enormous South Korean factory is dedicated to building instruments for other manufacturers, Cort does have its own range. These, with their lack of brand identity, often look like incredible value for the specs they offer. Can they genuinely be as good as the specs suggest? This OM is an all solid guitar with a piezo pickup and a hard case for a street price of £549, so it’s hard to imagine a better test. The Cort is, as you might expect, a fairly simply appointed guitar. The solid mahogany top is bound in black and white, featuring an equally simple black and white rosette. The topwood is attractively striped and stained a slightly deeper brown than the back and sides. The solid mahogany back itself is just as attractive as the top; bound in simple single ply back, while the sides are less figured, but hang together beautifully. The bridge is more attractively curved than the typical budget rectangle. It features a cutaway for the bridge pins which increases the break angle over the bridge and looks nice to boot. The bridge pins themselves are black plastic with a white dot. The compensated saddle is bone, very impressive at this price. The neck is mahogany with a rosewood fingerboard, carrying 20 skinny vintage style frets with simple pearloid dot position markers and a bone nut at the north end. The neck has a standard C profile, which will feel familiar to most people and works well with the cutaway to give you great playability. The simple headstock is adorned with an understated logo in a combination of different coloured pearloid inlays and off-brand closed back tuners with rubbery feeling black buttons. If all solid woods and bone nut saddle aren’t enough for the price, though, the AS-OC4 is ready for the stage too. There’s a Fishman Sonicore pickup hidden away in the bridge, with volume and tone controls secreted inside the soundhole. There’s no fancy head unit, so you don’t get a tuner and a wide array of controls, but the only thing to give away the presence of the pickup from the outside is the endpin jack socket. The Cort is also equipped with a second strap button on the underside of the heel, which is something we find mystifying by its absence on most guitars, so you can throw it straight on and play. Getting to the stage in question is facilitated by the fact that, unbelievably, the Cort also comes with a branded hard case. Quality wise, it’s hard to criticise the Cort. It’s simple, but beautifully executed. The intonation is perfect and it was delivered beautifully set up. It’s also remarkably light, which is not always what you expect from an East Asian-made guitar. One of the downsides on factory guitars like this is that they might have a good spec list, but they’re built heavy and lacking in resonance. So the light weight is a promising sign. Overall, it’s a handsome guitar, if a little undistinguished. The simple appointments and standard OM shape with a cutaway won’t especially grab the eye, but the rich finish of the woods is undeniably attractive. The AS-OC4 is a nice, comfortable size. It is a little deeper than some OMs, but not so giant that you’ll have to wrestle. The fairly slim neck profile will suit many players. And coming, as this did, well set-up out of the box, it’s an easy guitar to get to grips with. Mahogany has a reputation as a topwood for being dark, warm, perhaps a little quieter and certainly less trebly than spruce. This guitar impressively defies many of those expectations tonally, sounding unlike any other mahogany guitar we’ve played. First off, it’s loud; not quite up there with the earth shaking Boulder Creek jumbo we had nearby for comparison, but significantly louder than many spruce topped OMs we’ve played. Secondly, the treble is bright and sparkling; we’ve seen mahogany tone described as dry, which we take to mean a little lacking in sustain. There is no such effect here; the top end particularly has plenty of sustain. As you work your way down the strings, the midtones do start to show a bit of the warmth you might expect. By the time you get to the bass strings, it’s a very rich, warm, harmonic laden tone. The sustain does drop off a little in the bass; you won’t notice it strumming, but when playing gentle fingerstyle, it’s more pronounced. It actually combines with the warmth and slightly lower sustain in a way that feels very intimate and rather lovely. Style wise, this guitar is an allrounder. Strum it, and you’ll get a bright, free-breathing tone with plenty of volume. Dig in hard with your plectrum, and while it’s not a dreadnought, you’ll find plenty of headroom and projection. Play with your fingers, and you’ll find a wonderfully responsive, dynamic guitar which absolutely belies it price tag. Plugged in, the Fishman Sonicore pickup is a decent, though not stellar performer. The acoustic tone of the guitar is evident, but there’s a just a touch of harshness added; certainly nothing to put you off the guitar, but not up with the very best systems. The controls are adequate to do the job, but some players may find the lack of an onboard tuner or a notch filter an annoyance. But bear in mind that the system reflects the price of the instrument, and is more than adequate. It is truly incredible what has been achieved for such a low price. The specs of this guitar are amazing for the price. The fact that the tone and playability really live up to that spec sheet make this a category killer! The street price of the AS-OC4 will not get you near the cheapest Martin - which for £150 more will have laminate back and sides and is nowhere near as tonally satisfying. The Cort doesn’t have brand recognition, but for the player who is looking for truly excellent tone and playability on a budget, it’s hard to beat. We’re not sure we’ve ever seen a guitar at this price point that’s better, never mind one that comes with a pickup system and a hard case into the bargain. 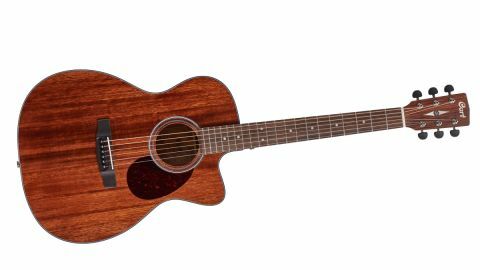 This is the kind of guitar you could buy tomorrow to schlep to open mic nights, safely cosseted in its hard case, and carry on to a festival stage 10 years from now in front of thousands of people. If you want a mid-sized guitar in this price range, you need to track one of these down and play it. You will not be sorry that you did.